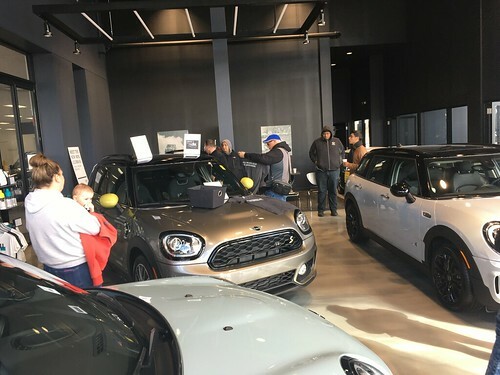 MINI Takes the States, MINI’s cross country party will be starting next week.. Some are doing one day, some are doing the whole drive. Who’s in, and how far are you going. MINIs will be back at Superdawg on a prime time Saturday night!! This year we will meet up beforehand for a fun little neighborhood cul de sac drive so we can all arrive en-mass. WRAPUP: A beautiful evening and a really fun drive.. We had almost 30 MINIs participate in a twisty neighborhood drive thru 14 cul de sacs. We were met by another 15 or 20 MINIs at Superdawg where we were treated to rock-star parking out front and center. A really nice evening for hanging around and visiting with MINI friends!! Huge thanks to Arnie and Lena for all the planning and route details, and to Superdawg for hosting our event! !